Despite Chael Sonnen's comments to the contrary, should he defeat Mark Munoz later this month at UFC on Fox 2, it will set up a massive title fight rematch with Anderson Silva later in the year. In a segment from last week's "UFC Tonight" program on Fuel TV that ultimately didn't make air, UFC President Dana White discussed where that fight could take place. "We're talking about doing the big fight," White said. 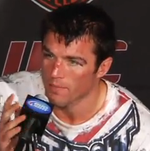 "Obviously, if Sonnen faces Anderson Silva, that's going to be a hot ticket. People from all over the world want to see that. That fight, if that fight goes down, it'll probably happen in Brazil and probably in a soccer stadium." If Sonnen wins on January 28, the fight could happen as early as this May. The rumored location has been in Sao Paulo, Brazil, and it would mean the UFC's third event in the country in less than a year after not running in the country since 1998. Penick's Analysis: If Sonnen gets past Munoz, the UFC legitimately could get 85,000 people or more into a soccer stadium in Brazil for that rematch with Silva. It will have some international travelers attending, of course, but the burgeoning Brazilian MMA fanbase will want to be in attendance for that fight. Sonnen has made himself a huge bad guy in Brazil, and for him to enter the country for this fight will make for a massive spectacle, especially if it does come in a soccer stadium.